Intersection accidents in Hollywood and across South Florida are a serious concern and causes significant injuries as well as multiple fatalities each year. 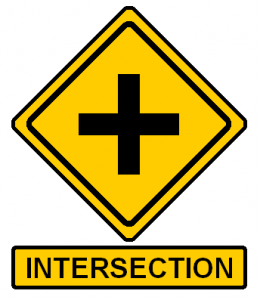 Intersections are high-risk areas because there are multiple vehicles and multiple types of road users – including pedestrians – using the same roadway and traveling in different directions. As cars turn, pedestrians cross the street and various road users are all trying to get to their destinations, accidents can occur if road signs are unclear and if people don’t use common sense as well as caution. Use extra caution when turning right on red. First, ensure that the car ahead of you is clear before proceeding. If you try to turn too quickly and the car ahead of you isn’t clear, you may end up in a rear-end collision. Always check right and left before proceeding through your turn. Prepare for an intersection as you approach it. Look for cross traffic when you’re just reaching an intersection. This will help you notice any potential hazards and adjust your driving for them ahead of time. Don’t assume right-of-way. Even if you have right-of-way, keep in mind that other road users and drivers may not necessarily stop to let you through. Be prepared to stop. Use your signal. This is important in letting others know where you’re headed. Don’t make sudden lane changes. Lane changes at an intersection are risky, especially when there is significant traffic. If possible, stay in your lane. If you have to make a lane change, do so gradually and use your signals indicate the maneuver. Leave extra space between the car ahead of you and your car. Rear-end collisions are one of the most common types of collisions at intersections and providing a little extra space can help prevent these crashes. Drive defensively. Always consider your moves a few steps in advance. This can help you avoid collisions if a vehicle break suddenly in front of you. Always look for and follow traffic signals at an intersection. They are there to keep you safe. Stay aware of what is happening around you. Use your mirrors and check blind spots as needed to ensure you can see what is happening around you. Keep in mind children, bicyclists and others using the intersection at the same time as you may not be as visible. Consider multiple road users. Watch out for bicyclists, pedestrians as well as other cars and vehicles. Keep in mind not everyone will be following the rules. Pedestrians may be crossing outside of crosswalks or other cars may be making illegal turns. Be prepared for anything and don’t assume other road users will always act in expected ways. Never drive distracted. Distracted driving is always a danger in Hollywood and other communities. At an intersection, it can be even more dangerous because there’s so much going on in this space. Avoid adjusting your radio, music or using your cell phone while approaching an intersection. Know what to do if a traffic signal isn’t working. Intersection accidents are more common in this type of scenario, according to Hollywood intersection accident attorneys. If a traffic signal isn’t working, treat the intersection as a four-way stop. However, use extra caution. Not every driver or pedestrian will know what to do in this situation and this confusion can easily lead to a collision. If you have been injured in a rear-end car accident or any intersection accident, contact Flaxman Law Group for a free consultation. Speak to an intersection accident attorney in Hollywood to find out what options exist for your situation. There is no cost or obligation for your consultation, so you risk nothing.